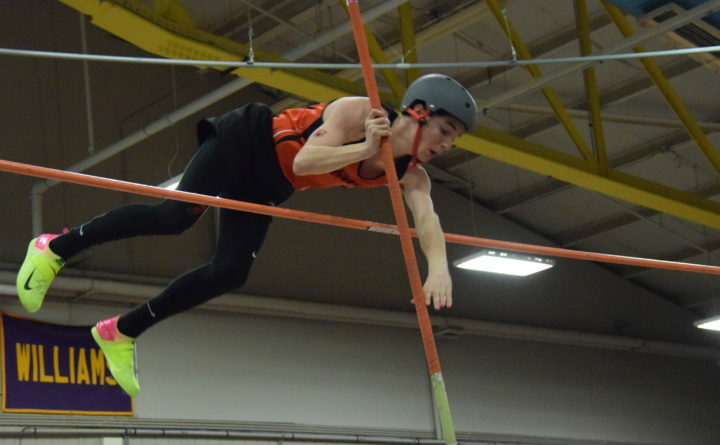 Greely of Cumberland Center picked up a sweep of the Class B indoor track and field state championships held Saturday at Bates College in Lewiston. The Ranger girls tallied 63 points to fend off a stiff challenge by runner-up Brewer, which scored 54.83 points. Belfast (38) took third, with Orono (35.330 and York (33) rounding out the top five. 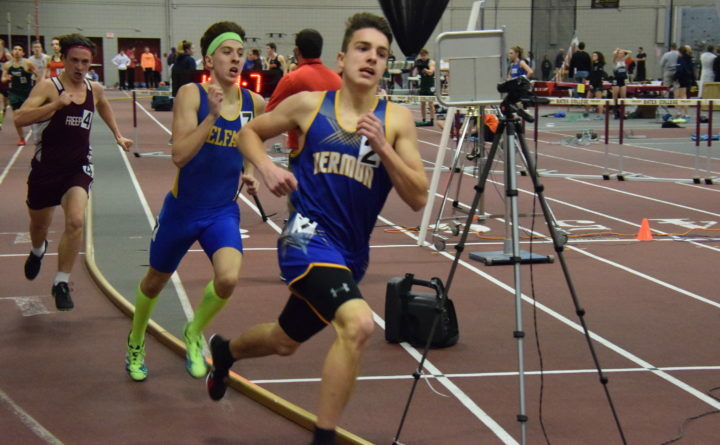 The Greely boys scored 68 points to fend off a strong contingent of PVC-Eastern Maine Indoor Track League squads that featured runner-up John Bapst of Bangor (54), Brewer (50.5) and Hermon (50), while York placed fifth with 45.5 points. It was the 15th state title and the second in a row for the Greely girls, while the Greely boys took home the program’s fifth crown and its first since 2009. 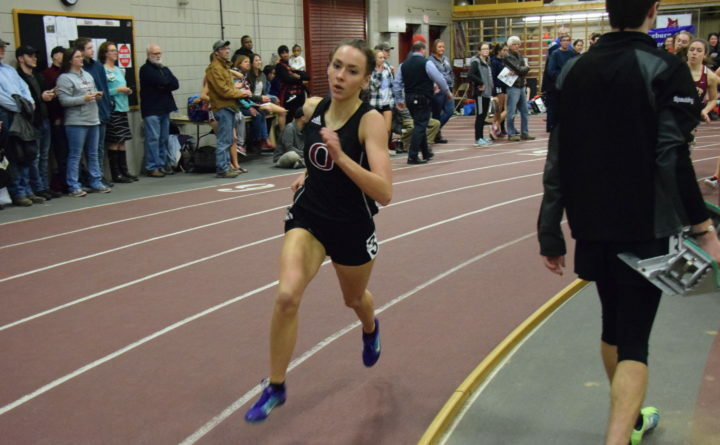 In the girls meet, Carolyn Todd set the pace in the mile (5:25.30) and the two mile (11:59.47) to spearhead the Greely victory. Elizabeth Brown claimed the high jump at 5-2 and Maggie McCormick was the runner-up in the pole vault, while the Rangers took top honors in the 4×800 relay in 10:18.05. Greely received third-place efforts from Marin Provencher (mile) and Julia Curran (two mile). Maddy Irish placed fifth in the triple jump and was on the seventh-place 4×200 relay. Brewer’s runner-up finish was led by Morgan Honey’s second in the 55 hurdles and her third in the triple jump. Brewer, which claimed third in both relays, got two fourths from Olivia Mosca (mile, two mile), a second in the pole vault from Kaitlyn Helfen, Hannah Hopkins’ third in the hurdles and a fourth in the pole vault by Madison Gibbs. Sophie Inman, Megan Friel and Ashlee Vilasuso also scored points in individual events. Third-place Belfast was paced by June McIntire’s championship in the 55 meters (7.46) and a win in the 4×200 relay (1:51.83) behind Emily Jolliffe, Mackenzie Banks, Kelsey Mehuren and Junne McIntire). Oliviah Damboise of Old Town claimed two individual titles, winning the pole vault (9-6) and the triple jump (36-4 3/4). Ashley Anderson of Mount Desert Island won the 200 (26.28), Camille Kohtala of Orono crossed the line first in the 400 (1:00.30) and Orono’s Katherine O’Brien leapt 17-4 1/4 to win the long jump. Other individual titlists were Kaylee Porter of Erskine Academy (800 meters, 2:20.14), Sarah Cox of Waterville in the shot put (39-1 1/2) and Cape Elizabeth’s Darcy Cochran (55 hurdles, 8.51). In the boys meet, Matthew Todd bested the field in the mile (4:40.32) and took fifth in the 800 as a strong distance presence helped propel Greely to the team win. 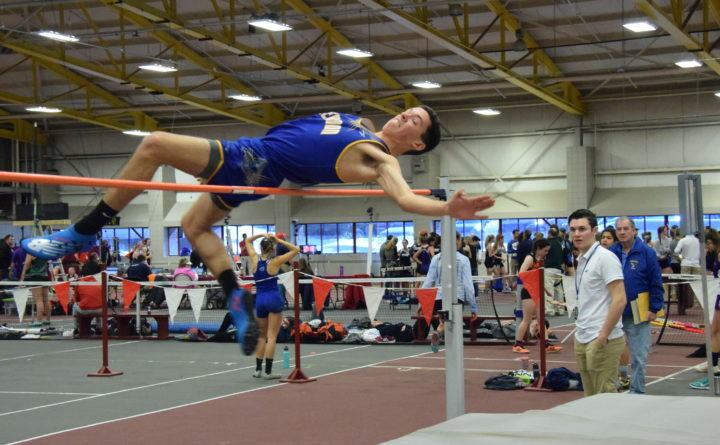 Luke Marsanskis was second in the two mile and fourth in the mile, Nicholas Brown was the runner-up in the high jump, Sam Wilson logged a third in the mile and Caleb Thurston finished fourth in the two mile. The Rangers were victorious in the 4×200 relay (1:38.28) and the 4×800 relay (8:43.22). Gavin Poperechny, Michael Geary and Brian Taylor also made the scoring column. Zach Beaton was a one-man wrecking crew for fourth-place Hermon as he turned in three championship performances. He won the 55 hurdles in 7.97 seconds, soared to 6-2 in claiming the high jump and went 42-9 1/4 to capture the triple jump. 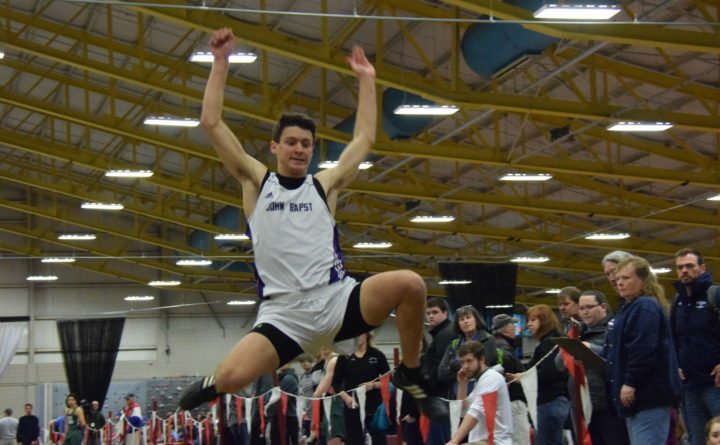 Ben Cotton was the catalyst for John Bapst’s runner-up team finish as he sprinted to first place in the 55 meters (6.75) and then soared 21-5 1/4 to win the long jump competition. 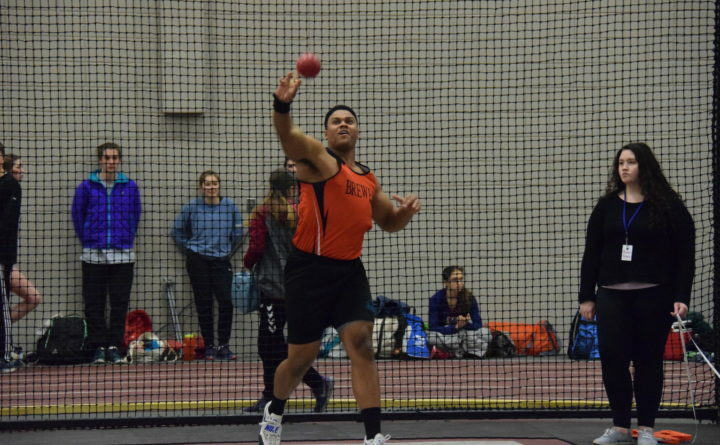 Brewer produced individual champions in pole vaulter Joshua Hart (11-6) and Garrett Graham in the shot put (50-1 1/2). Hermon’s Braedon Stevens ran to victory in the 800 (2:04.09). Luke Laverdiere of Yarmouth won the mile (9:35.31) and Matthew Concannon of Cape Elizabeth sped to the 200 win (23.32).